This free PowerPoint presentation covers the entire French Revolution (1789-1799) from the Old Regime, through the Tennis Court Oath, Reign of Terror, and death of Robespierre, to the coup d'état of Napoleon Bonaparte in 1799. Also included with the PowerPoint is a condensed version in guided student notes format, so that classes can follow along and take their own notes as the PPT is presented. This works for both high school World History and European History courses. Feel free to use it as a template for creating your own PPT, to use in the classroom with your students.This has a whopping 57 slides--it covers pretty much everything to do with the revolution in France. 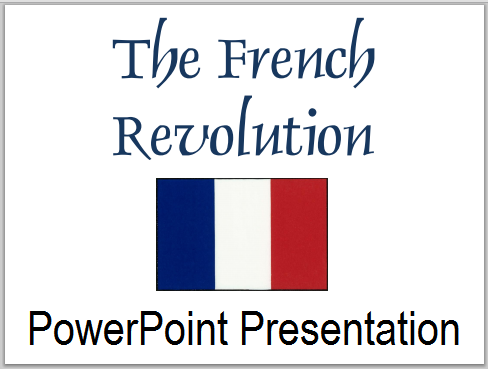 Here is a free PowerPoint presentation on the French Revolution that can be downloaded by teachers and students of Global Studies, Modern History, World History, and European History (both AP and general courses). 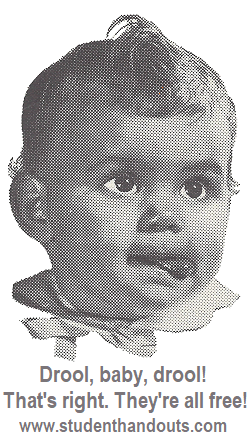 Included within the PowerPoint are two sets of recap/review questions. FYI: This PPT is also available in outline form...just go to the main page for teaching materials on the Revolutionary Period in France (1789-1799). 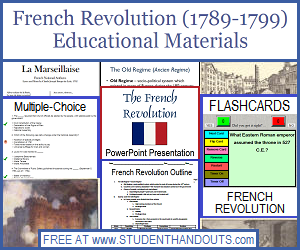 Click here for our complete listings of free teaching materials for the French Revolution. For our printable outline on the history of the French Revolution, click here.